The key to a successful vegetable garden is to eat the fruits of your labor. Anybody can garden like pros and enjoy a big harvest of tasty, fresh, and nutritious vegetables throughout the season if they know the essentials of successful gardening. One of the most important factor is having a good location. A good location is one that gets direct sunlight all or most of the day. Sun provides the energy the plants need to grow. Ideally, sunlight must not be obstructed at any time of the day. However, this is not always possible. Your property may be small or for some other reason your garden needs to be close to the house or a big tree that you do not want to cut down. If this is the case, choose a location south of the high objects if you live in the Northern Hemisphere. Conversely, choose a location north of the high objects if you live in the Southern Hemisphere, such as in Australia, South Africa, and South America. This way, high objects will not obstruct direct sunlight to any part of the garden at any time of the day. If the site you choose for your garden is east or west of nearby high objects, you still can grow vegetables successfully. Observe which areas get more sun and which areas get less sun throughout the day. The shade of high objects shifts continuously during the day, because of the rotation of the earth. Plant the fruit-bearing vegetables such as tomatoes, peppers, and eggplants in the areas that get at least 8 hours of direct sunlight daily. Plant leafy vegetables such as lettuce and spinach in the areas that get at least 6 hours of direct sunlight per day. Plant root crops such as potatoes, beets, and carrots in areas that get at least 7 hours of direct sunlight per day. Place your garden at a respectable distance from big trees. In addition to obstructing direct sunlight, big trees deprive nearby vegetable plants of water and nutrients. This is because tree roots are very big compared to vegetable plant roots and, therefore, have more capacity to absorb the soil’s nutrients and water. If you cannot locate your garden far from big trees, give the area that lies on top of tree roots extra fertilizers, water, and raise the level of the ground over the tree roots by adding topsoil. This added soil will provide the vegetable plant roots with a growing depth free of tree roots. If the trees are of the kind that develop shallow roots, like the maple and cottonwood, you will have to add more topsoil every couple of years. Most people position their garden in the backyard. In houses having a small backyard, the garden may be positioned in the front. The surface of the ground should be flat or have a gentle slope. A gentle slope facing south (if you live in the Northern Hemisphere) increases the intensity of sunlight. This is desirable for tender and very-tender vegetables because they thrive on hot weather. A gentle slope facing north (if you live in the Northern Hemisphere) reduces the intensity of sunlight. This is desirable for very-hardy and hardy vegetables, because they thrive on cool weather. 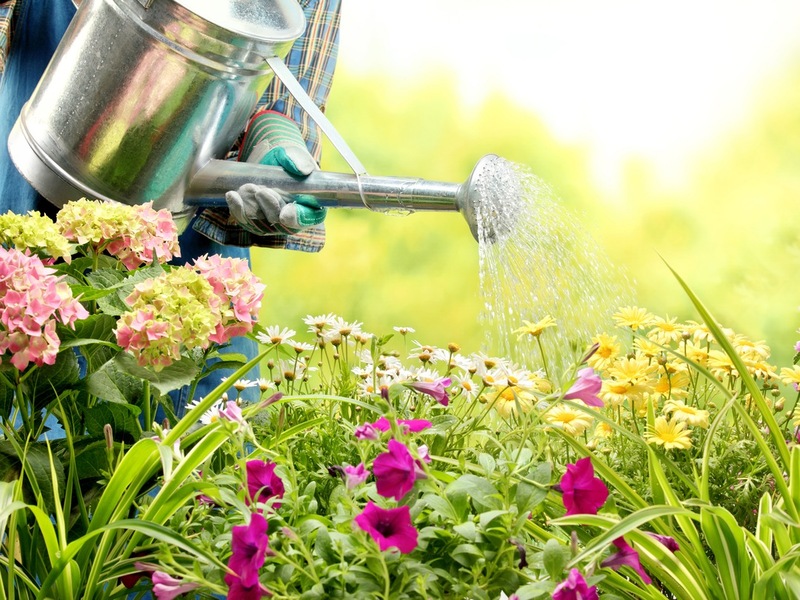 If the surface is too steep, water from rain and irrigation will run off quickly instead of seeping through the soil. Moreover, heavy rain will wash away the topsoil and the valuable nutrients it contains. To absorb more rain and reduce soil wash, plant the rows across the slope. If your area is windy, you may have to plant some high shrubs around the garden. The shrubs should be at least 15 feet from the boundary of the garden in order to prevent their roots from absorbing the nutrients the vegetable plants need.